Last week my home country celebrated the holiday of Purim; a holiday of joy, in which people go out to the streets, pretend to be something else by wearing masks and costumes, and exchange gifts. It is kind of like a happy mishmash of Halloween and Saint Patrick’s Day. And what excellent time it is to highlight interesting cases in nature in which one organism pretends to be another. One such story involves a genus of beautiful katydids – Vestria. Rainbow katydid (Vestria sp.). It is hard to describe how colorful these katydids are. This photo does not do justice to the insect’s beauty. When searching for arthropods in the rainforest I made a habit of backlighting leaves with a flashlight to see if there are animals hiding on the side opposite to me. There is always something interesting to find: salamanders, caterpillars, insects infected with parasitic fungi, and even velvet worms. Very often spiders occupy the underside of a leaf by day, waiting for nighttime to resume hunting on the top of the leaf’s surface. Among the most frequently encountered ones are huntsman spiders (family Sparassidae) of the genus Anaptomecus. These are flat, thin-limbed spiders, usually pale green in color to blend in with the leaf they are sitting on, but with a brightly colored abdomen with red and yellow patches. They are extremely fast, and when disturbed they shoot and vanish on the underside of a neighboring leaf. To my surprise, in some of these searches upon shining my light I thought I found a spider at first, but when I turned the leaf I saw a katydid nymph. Katydid nymph hiding under a leaf. Like Anaptomecus spiders, they too seem to prefer sitting on palm leaves. With the kind assistance of Piotr Naskrecki I learned that these are nymphs of Vestria katydids, known mostly due to their characteristics as adults (more on that later). Genus Vestria contains four species known from lowland forests of Central and South America, but do not let this low number fool you. There are many more species in need of a formal description, and others awaiting their discovery. In fact, to the best of my knowledge, all the species featured in this blog post are undescribed. The young Vestria nymphs bear an uncanny resemblance to Anaptomecus spiders. They too are flat, green with similar leg patterns, and have a bright yellow-red abdomen. Their mimicry to the huntsman spiders does not end there: they also share the same behavior of pressing flat against the underside of a leaf when resting, and running to the next leaf when disturbed. And, as I learned the hard way, they can bite. Like most members of tribe Copiphorini, Vestria katydids are packed with powerful jaws, and they will not hesitate to use them when in danger. By the way, these katydids are omnivores, feeding on both animal and plant matter, but they show a strong preference towards live prey, kind of like… well, spiders. Rainbow katydid (Vestria sp.) feeding on a beetle pupa. When given a chance they will always prefer a protetin-based diet. As adults, the Vestria katydids take a different look completely. They are no longer flat and look like the huntsman spiders. In this stage they are known as rainbow katydids or crayola katydids because of their striking coloration, which is an advertisement of their chemical defense against predators. When provoked, Vestria katydids curl their body and hunker down, revealing a brightly colored abdomen. They also expose a scent gland from their last abdominal tergum and release a foul odor that is easily detectable from a close distance. Different species of Vestria have different odors, and from my personal experience I can attest that some species smell as bitter as bad almonds while others smell like a ripe peaches. The compounds released are pyrazines, and there is evidence that this chemical defense is effective against mammalian predators such as monkeys. While many katydids have bright aposematic coloration, Vestria species are one of the only examples of katydids successfully deploying chemical defense against predators, making them distasteful. But don’t listen to me, I actually like peaches. Rainbow katydid (Vestria sp.) displaying defense behavior. But let’s go back to the spider-mimicking katydid nymphs. As it is often the case in nature, mimicry is not always straightforward. 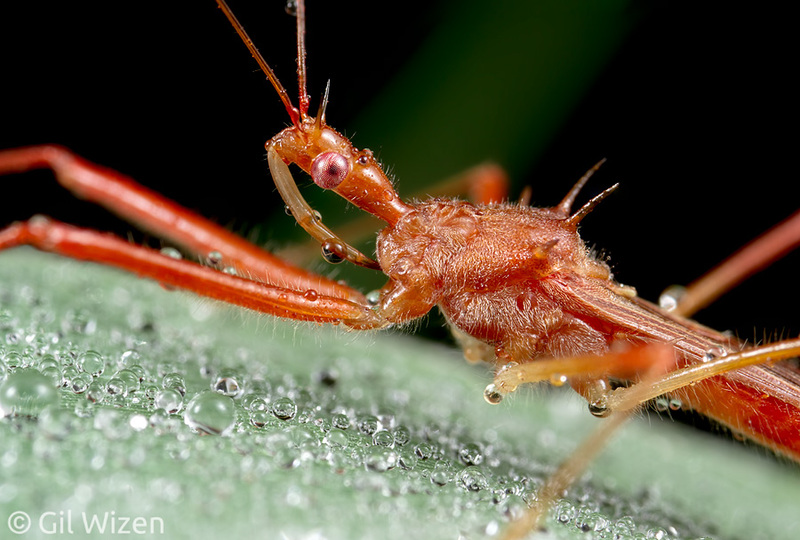 Why would a katydid nymph adopt the look and behavior of a spider? Avoiding predators may be the answer that comes in mind, however it is not that simple to explain. Although the model spiders are venomous, they are easily preyed upon by the predators they share with the katydids – birds, frogs and lizards. So what other benefits come into play here? And is it really a case of mimicry? It is a difficult question to answer, as there are several possible explanations for mimicry in this is a case. To put it into context, on one hand it can be an example of Batesian mimicry, in which one harmless organism adopts the appearance of another that is widely-recognized by predators as toxic, vemonous, or unpalatable, to gain an advantage when confronted with a predator. In other words, the katydids use their mimicry to signal visual predators (such as spiders, mantids) to avoid confrontation with a spider (I discussed a similar case here). On the other hand, it might be a case of Müllerian mimicry, two unpalatable organisms evolve to look similar in appearance, to send the same message to predators and enemies. It is possible that both the Vestria nymph and the spider are signaling that they are fast-moving and can deliver an unpleasant bite when provoked. In addition, both have some sort of chemical defense: the spider is venomous, while the katydid is distasteful. There is also a third option – that this is all coincidental, and it is a case of convergent evolution: the two organisms simply try their best to hide from predators and came up with a similar adaptation to solve a similar problem, without mimicry. Piotr suggested that this is simply a crypsis (camouflage) adaptation for the two organisms. The yellow-red spots can represent leaf damage that is commonly seen on leaves in the rainforest. It just goes to show that in nature things are not always easy to explain, because sometimes they do not fall neatly into our boxes of labeled natural phenomena. What do you think? Vestria nymphs have beautiful markings on their body, which can assist in breaking the outline of the insect to avoid detection by predators. In some species the dark markings remain also in the adult stage. Smile! You’re on katydid camera! UPDATE (14 May, 2017): Paul Bertner photographed this amazing butterfly pupa in the Chocó rainforest of Ecuador. It bears an unbeatable resemblance to the Vestria katydid nymph! Do the huntsman spiders feed on katydids? Maybe looking like a huntsman makes them less likely to get eaten by a huntsman because they are not into cannibalism? The sure do feed on katydids, and that is a great point that I forgot to mention. It falls under the Batesian mimicry option, in a similar context that I suggested for Petrophila moths: The katydid nymph signaling a spider predator to avoid confrontation with a “fellow” spider that can end in cannibalism. Thank you for such an informative article. I found one of these fascinating creatures in Ecuador a few weeks ago. It’s nice to be able to read about it here.